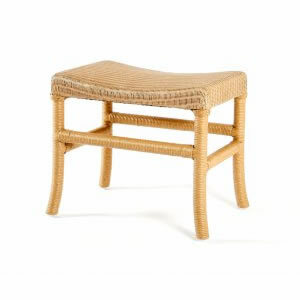 Originally made as a bedroom accessory, this elegant Lusty Lloyd Loom stool is now used throughout the house as an occasional piece of furniture. Light, strong and beautifully designed it can be painted in a choice of our colours or a colour of your own choice. This design is not suited to having a cushion due to the curve of the seat. Designed by Jim Lusty circa 1930. Available in brilliant white - clear lacquer would need to be ordered. For a special order delivery time is 14 - 16 weeks.